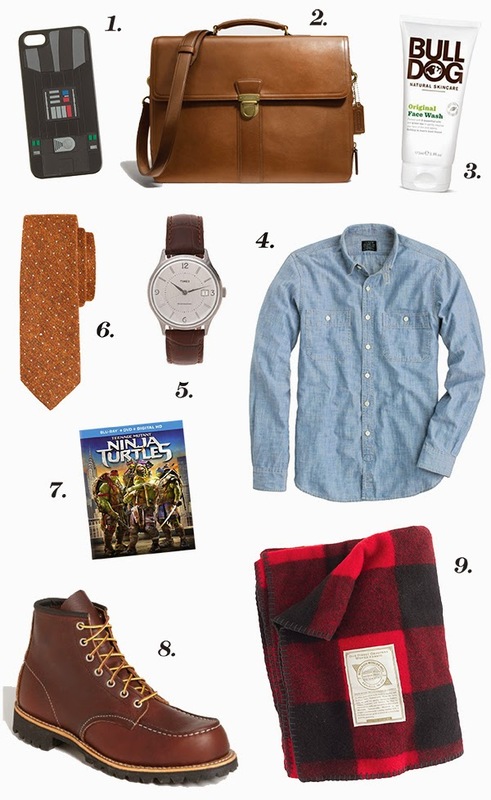 These final holiday gift guides are based on mine and my husband Brandon's personal favorites. Time for Christmas shopping is officially running out, but I hope these are still helpful for some of you as most of the vendors featured are still guaranteeing Christmas Eve delivery for a little while longer. If you're done for this year, (lucky you!) feel free to file these ones away for Christmases future or maybe take advantage of those post-holiday sales! 1. This Vegetable Spiralizer by Paderno ($34) has been on my wish list for months. In August, we switched to a mostly Paleo diet, and my good friend Cassie introduced me to this little gadget. Ever since I've been dreaming of zoodles and curly sweet potato fries! Available here on Amazon and here at Williams Sonoma. 2. Classic Hot Chocolate ($22, $17) // So remember that Paleo diet I mentioned? This is officially the item I'm most willing to cheat for. (I do substitute almond milk!) Usually I walk past items in Williams Sonoma thinking to myself, "People seriously pay that much for hot chocolate?" But my in-laws gifted us a package of this stuff and I realized that I've been dead wrong. This stuff is worth-every-penny life-changing. I don't think I can ever go back to Swiss Miss. 3. Moroccan Wedding Blanket Pillow Cover ($79) // I've been envisioning this pillow on our couch for longer than I'd care to admit. I love the texture and think these would be a great addition to just about any room! 4. Turtleneck Sweater (Also this one.) 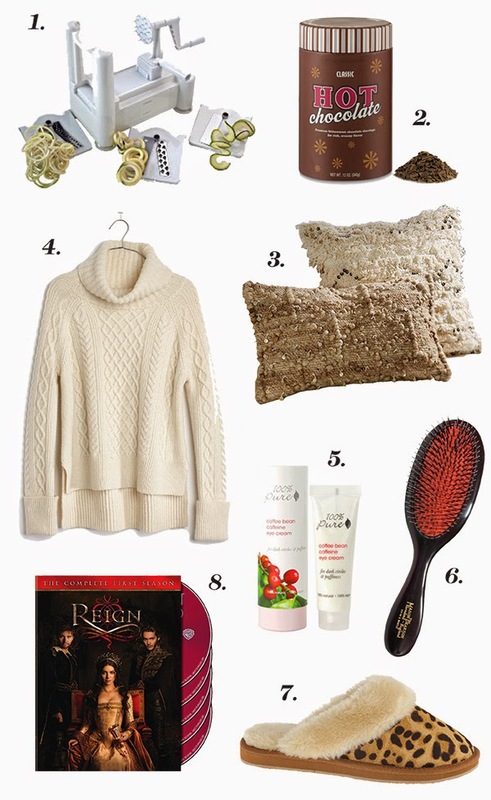 // I have been craving a cream chunky sweater and apparently so has everyone else. Seriously, every time I find one I like it's sold out when I go to order it! Sorry for the sold out link. I guess if you want a cream sweater, act fast?! 5. 100% Pure Coffee Bean Caffeine Eye Cream ($21) // In addition to the food we eat, we've also been trying to pay more careful attention to the products we use on our bodies and in our home. I personally love this line of natural beauty products and can't wait to try this highly rated eye cream! 6. Mason Pearson Hairbrush ($150) // This popular beauty splurge is a mainstay on my wish list. Do any of you have one? Is it worth the money and hype? 8. Season 1 of Reign ($60, $20) // After two people recommended it to me, this show has become my not-so-guilty pleasure in the last month. If you liked Sofia Coppola's Marie Antoinette and are even remotely interested in Mary Queen of Scots, then I guarantee you will be addicted. 2. COACH Leather Briefcase ($598) // I bought this briefcase for Brandon for our leather anniversary, after looking at about every possible option. In my opinion it's the highest quality, nicest looking briefcase under $1000. Seeing him carry it to work every day is definitely worth the splurge! 3. Bulldog Natural Skincare Face Wash ($10) // I've been looking for a natural men's skincare line to begin replacing Brandon's current products. I love the branding and the story behind this company. 4. Selvedge Japanese Chambray Utility Shirt ($98, $69) // This is Brandon's favorite chambray shirt. He wears it all the time! 5. Timex for J.Crew 1600 Watch ($148, $104) // Brandon always points out this watch in the J.Crew catalogs. With a design inspired by JFK, this is one timeless timepiece. 6. English Silk Tie in Microdot ($78, $42) // Brandon owns a very similar tie and I would totally buy him this one! 7. Teenage Mutant Ninja Turtles Blu-ray ($40, $15) // This movie is a total flashback for any guy who grew up loving the Ninja Turtles. One viewing in the theater was enough for me, but I can imagine Brandon watching this one over and over again. 8. Red Wing Moc Toe Boot ($270) // Ironically, when Brandon is not at work he likes to dress in casual workwear-inspired outfits. These are his absolute favorite boots. I bought them for his birthday last year and with proper care, they should last him years! 9. Woolrich Buffalo Check Blanket ($90) // I just love this blanket and I know Brandon would too. He has a red and black buffalo check jacket that he wears all the time.